The weekend was beautiful, sunny and dry...perfect for a small weekend project that's not a big commitment, leaving plenty of time for kid's soccer games and lounging in the pool! As I fill my small piece of paradise with various tropical plants that I've never enjoyed out of doors before relocating to S Florida, I have found that I've made my yard maintenance quite time consuming, to say the least. Mowing/edging takes considerable time. Additionally, I am very interested in transforming much of my yard into alternative ground cover, vs. the traditional lawn. Therefore, I've begun cutting out garden spaces. This weekend, I tackled one such space, connecting two Orange Jasmine bushes that flank a window at the rear of the house. I'm certain my husband will call for a divorce if I spend more money on plants right now (just kidding), so I decided to fill the new space with existing plants that need thinning or relocating. I planted the space between the Jasmine with ground orchids that were planted on the shaded north side of the house. Hopefully the relocation (morning sun exposure) will help them to bloom and flourish! 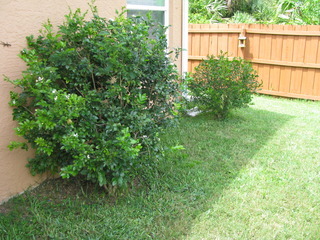 I also filled a small spot between the pool deck and Jasmine with rapid spreading oyster plant ground cover. Finally, I finished with some scalloped edging we had laying around. The space left from the relocated ground orchids was filled with additional oyster plant that won't mind the lower light conditions. I also relocated a struggling mandavilla vine to a less harsh location along the fence row and filled it's empty space with a couple of new Ti plants and succulents that I'd been rooting. 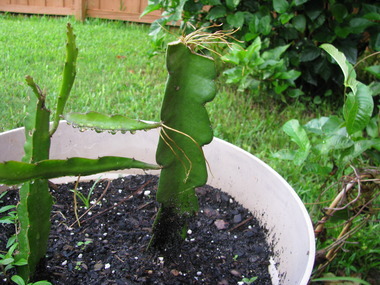 The Ti plants are so easy to propogate...just cut the stalk and stick them in the ground...as long as they receive water, they will root and reproduce quickly, forming lovely, bushy red/burgandy foliage. The succulents I planted in this space are fast growers as well...we had two dying stalks that we planted in a pot for about a month and they are producing numerous shoots and roots everywhere! To complete the perfect weekend, one of my Queen Emma Crinum lilies, that has been in the ground for 1-1/2 years without a bloom, produced a beatiful bouquet for us! And the honey suckle bloomed, providing the kids and nature with some yummy honey flavored syrup! Heres to a great weekend, and a simple, small garden project! I am a serious weekend project person... but you are one motivated lady. This is so simple and great- I am so glad you are going away from the traditional lawn! Lots of ideas for that on LAWN REFORM- google it! It&#x27;s a group of people dedicated to getting lawns out of yards:) They have lots of good ideas there.